Magnus Carlsen smiles after leaving his glass box of emotion (and chess). Carlsen won the 2018 World Chess Championship on Wednesday. Over his last 24 regulation games at a world championship, Magnus Carlsen has won only one of them. But no matter: his ability to stay afloat during regulation and pounce in fast tie-breaking games that follow have been good enough to win the last two world titles. Yes, you read that right. It’s over. And Magnus won. Carlsen, the Norwegian world No. 1, finally won the 2018 World Chess Championship on Wednesday. After 12 straight draws and a match that appeared hopelessly deadlocked, Carlsen cruised through the tiebreaker games, securing the match and his fourth straight championship in dominant fashion. His challenger, Fabiano Caruana of the U.S., was trying to become the first American world champion since Bobby Fischer in 1972. It’s a feat that will have to wait at least two more years. As the top two grandmasters in the world donned their blazers and took their seats in a soundproof glass box in London on Wednesday, the chess world was still gluing itself back together. Two days earlier, it was shattered by Carlsen’s offer of a draw to Caruana after just 31 moves in the final regulation game of the match. Detractors saw Carlsen’s decision as cowardice — the former world champion Garry Kasparov said that Carlsen was losing his nerve. Others saw it as the final, asphyxiated breath of slow, “classical” chess. Computers, and the preparation they offer, had doomed the game to draw after draw. His supporters, though, saw it as a shrewd bit of gamesmanship. Carlsen, as it happens, is the best speed chess player in the world. And whatever the draw gambit says about the larger state of chess itself, it worked like a charm for Carlsen. The tiebreakers began with best-of-four “rapid” games, in which each player was afforded 25 minutes for their moves, with 10 bonus seconds after each move. (The regulation games, by comparison, began with 100 minutes each, 30 bonus seconds, and further bonus time as the games progressed.) Even faster games would come, if necessary. They wouldn’t be necessary. In fact, neither would the fourth rapid game. Carlsen won three rapid games in a row in dominant fashion. Game 1 began with the English Opening, which Carlsen has favored with the white pieces in this match. Specifically, it was a Botvinnik English system, which afforded Carlsen early control of the center with two advanced pawns. It was a smart choice for a rapid game, as it would allow Carlsen to play on both sides of the board. Indeed, Caruana was the one who was first to really stop and think, on his sixth move. Things looked messy for black. But Caruana macheted through that mess and created some counterattacking chances. But his position unraveled on his 19th move. Caruana faced the position below. He elected to hop his knight to b5. Bad idea. This allowed Carlsen’s white knight to come to c5, and then to e6 capturing the bishop, and opening up a scary attack on the black king. 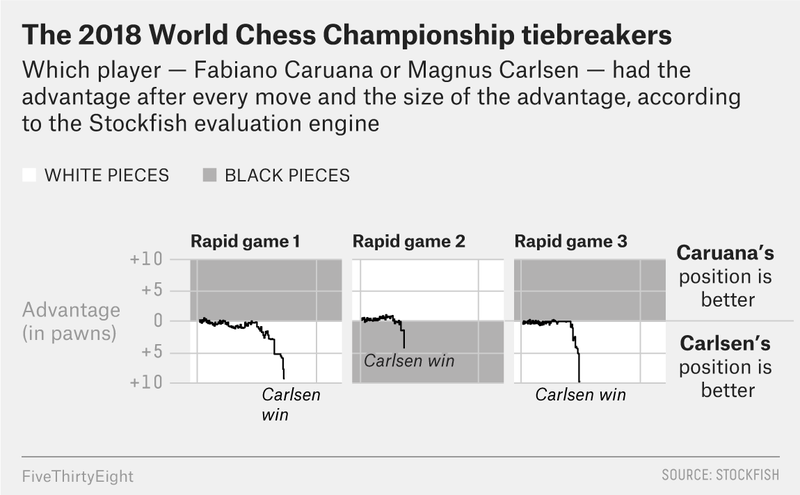 The supercomputer analyzing the game quickly jumped to show the biggest advantage of the match thus far — nearly three pawns in Carlsen’s favor. Carlsen waited over nine minutes to make his 24th move, his clock dwindling to four minutes as he strained to find the winning line. He opted instead for one that liquified pieces in order to simplify the board and the grandmasters entered a rook-and-pawn endgame with Carlsen up a pawn. It appeared to be an endgame that Caruana could hold — another draw — but he fatally erred on his 37th move. He grabbed a white pawn, but lost a critical tempo. His pieces were now too slow to stop Carlsen’s advance. Carlsen’s two advancing pawns became unstoppable. Caruana resigned on the 55th move in the position below. Blood had been drawn at last! Caruana took back the white pieces for Game 2, sorely needing a win. The game began just as the controversially drawn Game 12 had, in the Sveshnikov Sicilian. Caruana played aggressively, pushing a pawn far up the board early on, and following it with an aggressively placed queen and knight. But he pressed too far on move 26, in the following position. He pushed his pawn another square, to c7. But that pawn could be captured, and Caruana’s queen was soon in dire trouble. He resigned two moves later. As Game 3 began, Caruana needed to win two consecutive games against the best in the world. Caruana abandoned his favorite opening with black, the Petroff, and the game began with another Sicilian opening — a major theme of the match, and one that could give chances for black. But Carlsen navigated the position nimbly, even opening up an advantage in the middlegame. Caruana continued to press — what choice did he have? — but his position collapsed. He resigned on the 51st move. After 15 games over nearly three weeks, this was the final position on the final board. White’s two queens are a fitting symbol of Carlsen’s dominant performance. Regardless of the lopsided tiebreakers, and regardless of (or, perhaps, because of) the 12 straight draws, it is safe to say that we have just witnessed a match between the two best chess players in the world. “I wouldn’t say it was easy,” Carlsen said. “It was only at the end that I was able to trick him,” he said of the first tiebreaker game. He added that he thought Caruana was his strongest challenger. (Sorry, Sergey.) And he defended his decision to offer that draw in Game 12. In hindsight, I suppose, it’s hard to argue with him. At the post-match press conference, Carlsen was asked about other grandmasters’ criticism of his draw offer in the final game of regulation. “They’re entitled to their stupid opinions,” he said. He went on to say that more emphasis should be placed on rapid and blitz games, rather than the lengthy “classical” ones that have traditionally been used to determine world champions. In classical chess, he said, Caruana has just as much right to call himself the best in the world. If Caruana gets back to the world championship, Carlsen will be there waiting for him. And, media gods willing, so will we! But that’s not until 2020. For now if you’re somehow in the mood to read more about chess and Carlsen’s excellence, here’s the embarrassing story of when I faced off against him. You will totally believe who won.